Mooseman.de - Picture of the month - February 2015 - What Is That? Time for another moose image - finally it's still the heart of the web to promote this awesome, although somewhat curious, species. Another time the crime scene was located in my favorite wildpark Hundshaupten. A new, young bull moose with still scanty antlers and a male yearling were tramping around the spacious preserve. 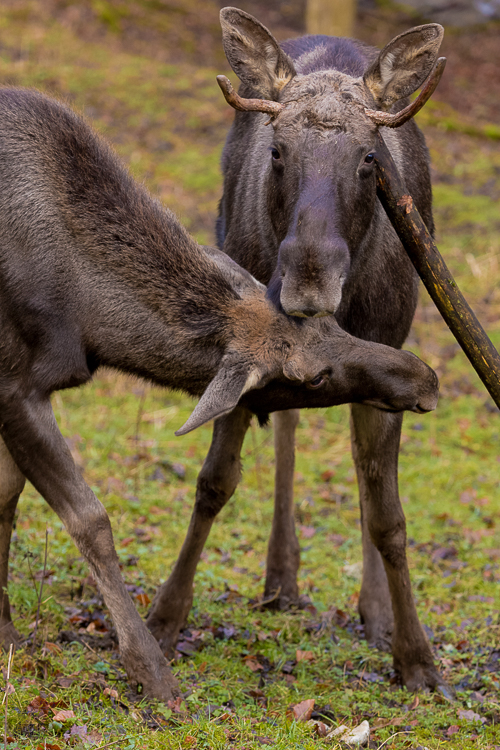 When I just had decided to move on, the bull moose turned down his head to the ground, and when he lifted it again, a long branch had entangled with the back of his antlers - leaning now against his shoulders while he looked slightly confused. It seemed that the yearling shared my thoughts. To get a better view he lowered his head und looked below the bulls head to the branch as well. The gesture and look of the young moose at the moment I took the picture let me interprete his thoughts as: "What Is That? What the heck are you doing?". A lucky moment indeed for me - a funny situation making me smile and a camera tensely at attention at the very right instant.